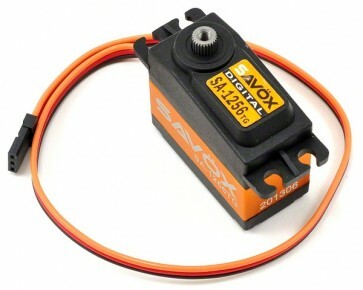 This is the Savox SA-1256TG Standard Digital "High Torque" Titanium Gear Servo. The SA-1256TG pushes 277.2 (20 Kg) oz of torque and this servo is perfect for those who are looking for a minimized backlash to use in the wings of RC planes. The SA-1256TG sports titanium and metal gears to keep things strong and running smooth.